Calling all ballers: the 2014 roundup is here. Check out our top 5 meatballs in New York City. Welcome to the '50s. Mario Carbone and company sling "midcentury Italian-American fine dining" at this old-school downtown haunt, complete with cobalt walls, rich leather banquettes, and a killer cocktail list to boot. Now let's get down to business. 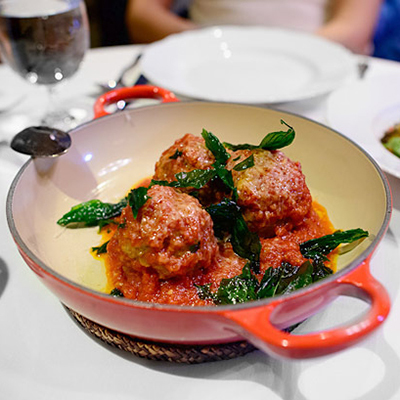 Carbone's meatball packs a punch with its generous size and sumptuous flavor, a symphony of meat composed with beef, veal, and pork and spices typically found in any nonna's cupboard. Carbone seals the deal with a rough, hearty tomato sauce and a side of American nostalgia. The challenge at Andrew Carmellini’s consistently packed TriBeCa stunner is deciding what not to order, as every single item on the menu proves impossible to pass up. Exhibit A: lamb meatballs smothered in garlicky tomato sauce and creamy Caprino cheese wedged between perfectly petite mini buns. We'll take a tall order. Carmellini strikes again. 2014 saw the arrival of this pastificio, perched proudly on Bowery and East 2nd Street, bringing honest, casual Italian fare to the downtown foodie scene. This down-home-meets-upscale pasta parlor serves up a mean handcrafted meatball filled with dreamy melted fontina and smothered in a rich, rustic tomato sugo loved by all. East Harlem's crown jewel boasts not only New York's most exclusive table, but also what is arguably the borough's best ball. This legendary spot takes meatballing to the next level with Anna and Frankie's traditional recipe, calling for handmade breadcrumbs and yielding a super-light, incredibly tender meatball fit for a king. Let’s face it, there’s nothing Michael White can’t do. After a frenzy of city openings, Osteria Morini still holds court as a consistent power player in the White empire, churning out delicious Italian fare to the hungry masses. OM's enticing blend of prosciutto and mortadella reigns supreme, baked to perfection and served in a scintillating pool of cheese-laden tomato sauce. Enough said.